BEST PLACE TO LIVE ON THE PLANET! 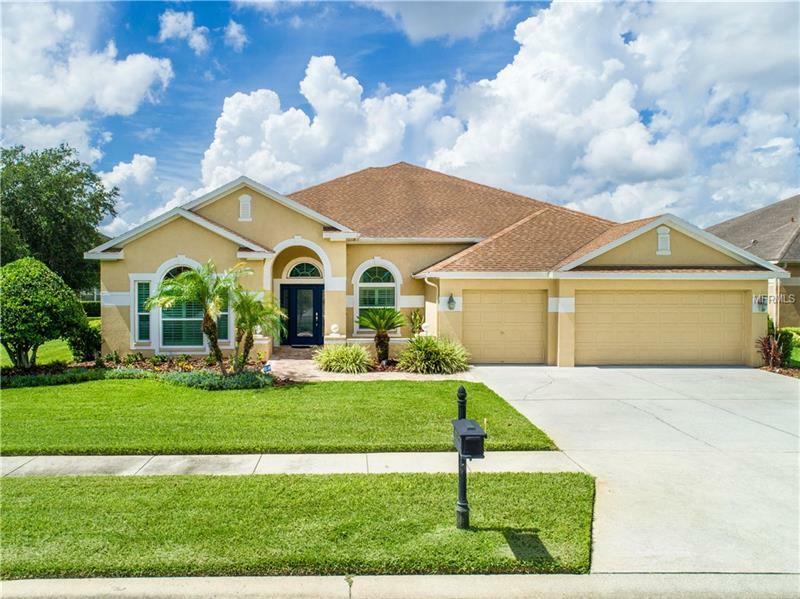 Gated community of Lakes at Sabal Ridge quite boutique community in Pasco County. Fabulous David Weekley built 4 bedrooms-3 bathrooms-office-bonus room-located on over-sized pie shaped lot on the pond. The home is totally updated-front entry foyer w/wood floors throughout living room-dining room-office-kitchen-breakfast-family room & master bedroom. The formal areas are complete w/crown molding. Plantation shutters on all windows. Double glass french doors take you to the covered lanai & screened pool area. Spacious front office w/closet making working at home easy. Kitchen complete w/42" wood cabinets & crown molding trim-granite counter-tops-stainless steel GE profile appliances-induction cook-top-walk-in pantry-desk area-island w/granite top-breakfast bar open to family room-built-in shelving for electronics-large windows allowing the natural light in. Two yr old double pane low-e windows throughout. Triple split floor plan. Master suite on one side providing privacy-access to pool-master bathroom updated w/double vanity/sinks-garden tub-glass shower-his & her walk-in closets. The guest suite to the back w/its own access to the pool & privacy. Two guest rooms w/Jack-n-Jill bath between-each having its own vanity/sink dressing area-sharing the tub/shower & potty. Built-in closet w/shelving for great storage. Second floor has the bonus room. Seller credit for roof $10000 - Conveniently located to everything-shopping-dining-more! !